Hi everyone! It’s been a while since I have posted. There are many wonderful things going on with the choirs that I would like to share. We started off the year revoicing all of the choirs and now we are starting to read all our new music for our spring concert. I have begun to post YouTube videos on each choir’s page so be sure to have students take a look at these and parents feel free to preview the music as well! 8th grade students registering for their choir next year, please only register for Men’s Chorus or Women’s Chorus. No one should register for Da Cantari. That is an error on the sheet. I must sign the paper copy of the sheet after you select your choir. Please bring that to me during class to sign. The Concert Choir has two big events coming up. On Thursday March 3rd 7:30 p.m. Concert Choir will be singing a combined concert with Da Cantari, one of our Avon Lake HS choirs and they will be performing selections from Mozart’s Missa Brevis in C. This will feature a chamber orchestra and will be apart of the high school choral concert. Concert Choir will also be touring to Columbus, OH March 18-19 where they will have a choir clinic at OSU, perform at the Ohio State House, tour the city of Columbus, see Beauty and The Beast at the Palace Theater, go to the Columbus Zoo and the Olentangy Indian Caverns. If you would like to see a full itinerary of the trip, please go to the Concert Choir Page on this website. Congratulations the the Learwood A Capella Ensemble as they were selected to be the Guest Ensemble for the Avon Lake Elementary Choir Festival. The A Capella Ensemble just gave a great performance at the Winter Pep Rally singing the Star Spangled Banner and the Alma Mater. The 8th Grade Mixed Choir and I are very excited that we have commissioned Dr. Philip Silvey to compose a piece of music for our 8th grade mixed choir. The piece is entitled Amour Vincet Omnia and the text comes from a staff member’s husband from Learwood MS who is a poet. Donna Widener’s husband Rick Widener passed away two years ago and when I went to the viewing in support of Donna, I fell in love with his poetry. Donna is thrilled and our students are loving all aspects of the commission. Dr. Silvey will be our composer in residence May 23-25 and the work will be premiered at our spring choral concert Wednesday May 25th at 7:30 pm! All of our choirs will be performing one of his pieces and will get a chance to work with this fine conductor and composer. Finally, you will see me post real soon in regards to our music department Fundraiser which officially kicked off yesterday! Stay tuned! 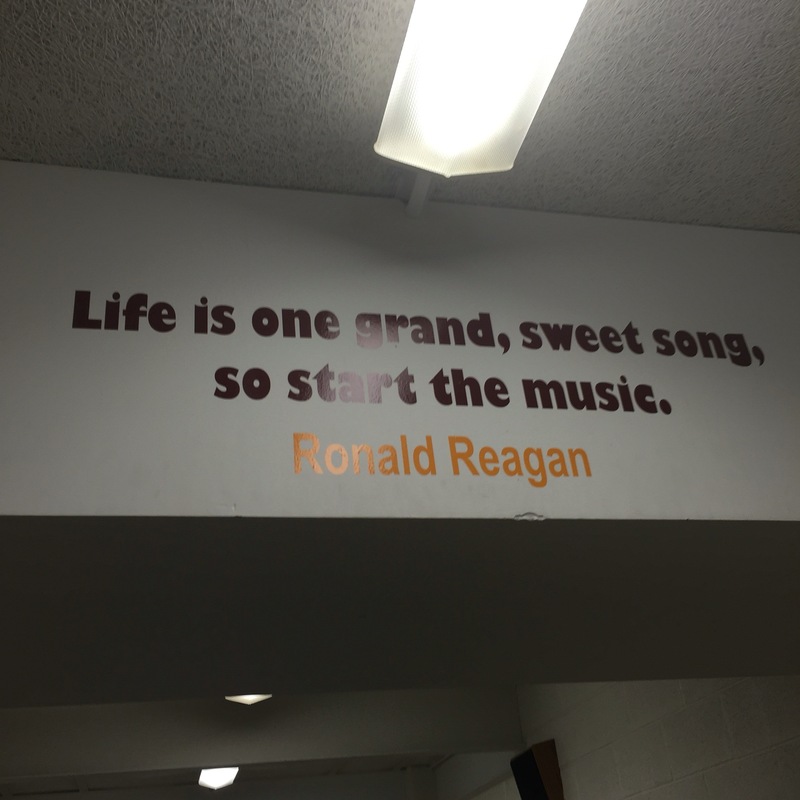 New quote above the music department hallway!